Bottom Line: Huh? Yeah that’s not going to happen but most people don’t realize that gravity is a killer. That’s right, the same force of gravity we enjoy everyday that lets us enjoy our morning cup of coffee and hang out with our loved one’s is the same force of gravity that’s putting stress on our body’s bones, joints and nerve system. Gravity keeps our feet on the ground, literally, by pulling our bodies towards the center of the earth. Why it Matters: Gravity on our skeletal system can lead to early spinal degeneration and arthritic changes. We love gravity for the many gifts it offers us. Sure, it would be tough to play fetch with Fido if it wasn’t for our good friend gravity. However, gravity is putting excessive stress on your misaligned skeletal system that can slowly lead to early degenerative disease and neurological imbalances. Unfortunately, we can’t suspend gravity or reverse the aging process. But, we can make smart decisions about our health care to stay healthy and active. 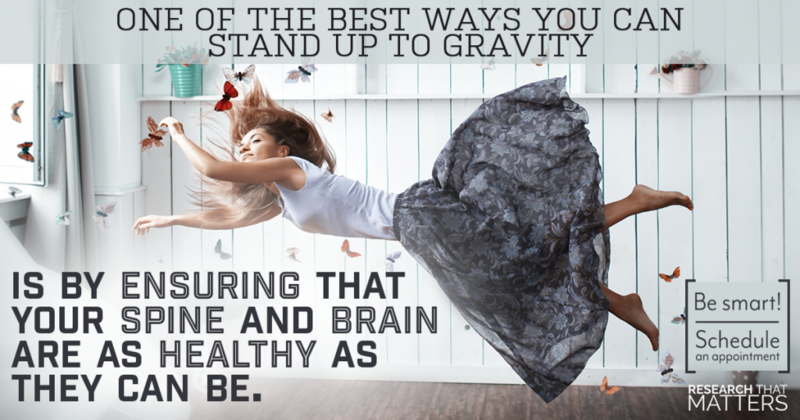 One of the best ways you can stand up to gravity is by ensuring that your spine and brain are as healthy as they can be. That’s what chiropractic care helps you do. Next Steps: We’ve said it before and we’ll say it again. Being healthy is more than just a matter of how you feel. It’s a matter of how you function. That’s the primary objective. It’s wonderful to feel better. It’s genius to function at your very best. Elevation Chiropractic in Truckee California is here to help you with almost any ailment using and effective gentle and relaxing approach. Call and schedule an appointment today and make gravity work for you not against you.